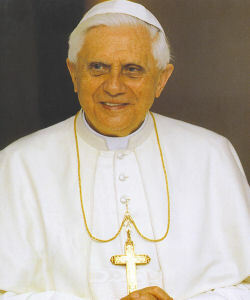 Pope Benedict yesterday restated the view of the Catholic Church that marriage should only be between a man and a woman. Despite not referring to the ruling of the Californian Supreme Court in favour of gay marriage, Vatican City watchers believe the restating of the Church’s position was a reaction the ruling. “The union of love, based on matrimony between a man and a woman, which makes up the family, represents a good for all society that can not be substituted by, confused with, or compared to other types of unions,” he said. The Pope was speaking to representatives of European family institutions. He told them that the traditional family, “founded on matrimony between a man and a woman, to be the natural cradle of human life”. The court ruled that lesbian and gay couples are entitled to the same fundamental right to marry as heterosexual couples as protected by the California constitution. The decision explicitly strikes down Proposition 22, a voter-passed initiative in 2000 that sought to limit marriage to between a man and woman. Under California rules of procedure, the decision can not go into effect for at least 30 days. While it was a 4-3 decision, the language used by the court in relation to the nature of gay and lesbian relationships sends a clear message that the state should treat all citizens equally regardless of their sexual orientation. Last year, the Catholic Church campaigned against an ill-fated attempt by the previous centre-left government to give gay couples more rights.